LIVE CLOSE TO EVERYTHING!!!! 4-Level Split in Inner-City gem of Mayland Heights. Loads of Potential with this Solid Family Home on quiet street in established inner-city community. Newer windows, newer furnace, long lasting concrete roof tiles and Original hardwood throughout the upper floors. Main floor welcomes guests with a large living room with wood burning fireplace, good sized kitchen and dining area with sliding doors to huge covered patio. Upstairs - 3 bedrooms - full bath - hardwood floors. Third level - 4th bedroom, 2 piece bathroom, massive family room, large windows and a walk-up entrance to the back patio. Fully finished basement - lots of storage, rec room and laundry room with shower. Low Maintenance Back Yard has a large covered patio, large double garage and a double parking pad. 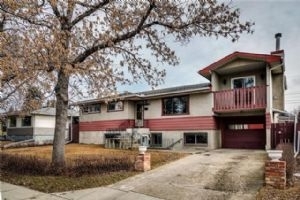 Minutes from downtown, Close to transit, schools and shopping. Easy access to Deerfoot, 16 ave, Barlow and Memorial. Worth a look!